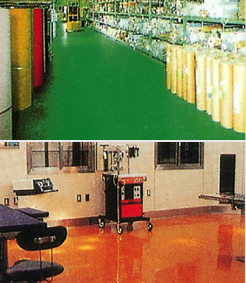 A doctor(Epoxy) seamless flooring which is formed with high quality epoxy resin, hardener and special agents, contains special feature that are dust free, seamless and easy to clean. It is suitable for G.M.P. flooring, warehouse, hospital, electrical factory and so on. The surface should be clean off such as existing sealers, curing materials, grease, oil, and dirt. Use the solvent based for the concrete whose moisture content is below 8%; use the water based for the concrete whose moisture content is 8% to 16%. Solvent based:After mixing 1050A/B(the mixing ratio is 2:1) evenly, brush or spread on the floor and leave it until dry before apply second layer. Resin floating method : Mixing 1030/2108-W (for winter), 1030/2108(for summer) or 1030/5340 (chemical resistance) evenly with the mixing ratio 2:1. Adding #9 silicon sand in it if needed. Smooth the surface and wait until dry before apply top coating. 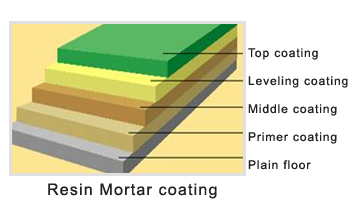 Resin mortar method : Mixing 1010/2108 evenly with the mixing ratio 2:1. Adding 3~5 times #9 silicon sand in ti. Smooth the surfaces and wait until dry before apply top coating. 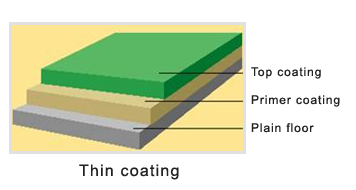 Putty : If the surface is uneven, use 1351A/1351B(the mixing ratio 1:1) to create an even surface. 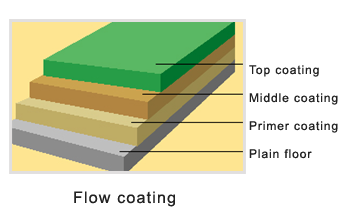 Top coating operating : Trowel epoxy resin(color can be changed) and hardener by the ratio 3:1 or 5:1; then wait until fully cured (3 days). The ground surface must be hard, smooth and non-peeling. Store product in unopened container in a cool dry location. Use the circle bucket to mix the materials. 1351A/B is used to fill holes. Apply on the wall first. Wait one week for every layer to cure fully. Use up the product within the suggested time. Primer coating 1050A 100 1050A 50 Pale yellow 100min. 8hrs 50~200 Solvent base, low viscosity,excellent permeation,adhesive to cement. flow mortar 2108A 100 2108B 50 yellow 40min. 12-14hrs 600~1200 High strength, good toughness, easy to implement. Middle coating 5340A 100 5340B 50 Brown Dark 60min. 12-14hrs 500~1500 High strength, impact and abrasion resistance, acid and alkali resistant. Leveling paste 1351A 100 1351B 100 Pale white 30min. 6hrs paste Good adhesion, non-sagging, to level ground. Top coating-thin layer 5121A 100 5121B 33 Selective colors 30min. 8hrs 4500~6500 Solvent base, high anti-abrasion, excellent coverage. Top coating-thick layer 5120A 100 5120B 33 Selective colors 30min. 12hrs 4500~6500 Non-solvent, high abrasion resistance, high gloss and smooth. Top coating transparent 5110A 100 5110B 50 Transparent 30min. 12hrs 800~1200 Non-solvent, good chemical-resistance, no toxicity. Acid and alkali resistance top coating 5140A 100 5140B 50 Transparent 30min. 12hrs 600~1000 Non-solvent, acid and alkali resistance. Electric conductive top coating ConductA 100 ConductB 33 Selective colors 40min. 24hrs 500~700 Good conductivity, good chemical property. Primer coating 3118BottomA 100 water 100 3118BottomB 100 Cream 50min. 24hrs 2000~6000 Water-born base, moderate viscosity, excellent hydrophilic, adhere to cement. Top Coating Water-born base type 3118 top A 100 3118 top B 20 Selective colors 60min. 18-20hrs 600~1000 Water-born base coating, good hydrophilic.